Before deciding to do the 6 week transformation with Adam, I felt stuck, felt I had hit a wall with training. I was training in cave classes 5/6 times a week, eating what I thought was ‘good’. I got to a point in training where I felt I couldn’t and wasn’t progressing, my body wasn’t changing no matter how much I trained and ‘dieted’ and just felt I needed something to push myself, something to get me out of my comfort zone. This intense 6, what turned into an 8 week journey did exactly that. My training consisted of 3x weight sessions and x2 cardio sessions a week. Cardio being a circuit Adam set up for us, or jumping in class. As quickly as week 1 I could see small changes, just by tweaking my diet, adding the correct foods/supplements and removing certain things. I’m not going to say it’s been easy, far from it. In fact, it’s been so tough thinking back. I’ve felt so many mixed emotions throughout the 8 weeks. There has been times in sessions where I’ve wanted to give up, walk out, I’ve felt like a failure and called myself a failure. There have been days I’ve almost cried in training and not forgetting the constant ache from head to toe, but then, there has been days where I’ve been so proud of all the hard work and dedication Ive put into this, proud of extra reps, proud of gaining strength, having that will power around foods, I’ve felt strong and successful! Adam has been one hell of a coach. Not just to help to transform my physical appearance, but changed my mindset too. My attitude towards having a ‘healthy lifestyle’ not a constant ‘diet’ has utterly changed because of this. I’ve gained so much knowledge from Adam, on nutrition, what’s good for you, when to have certain foods, what to have and simple things like correcting form on exercises. 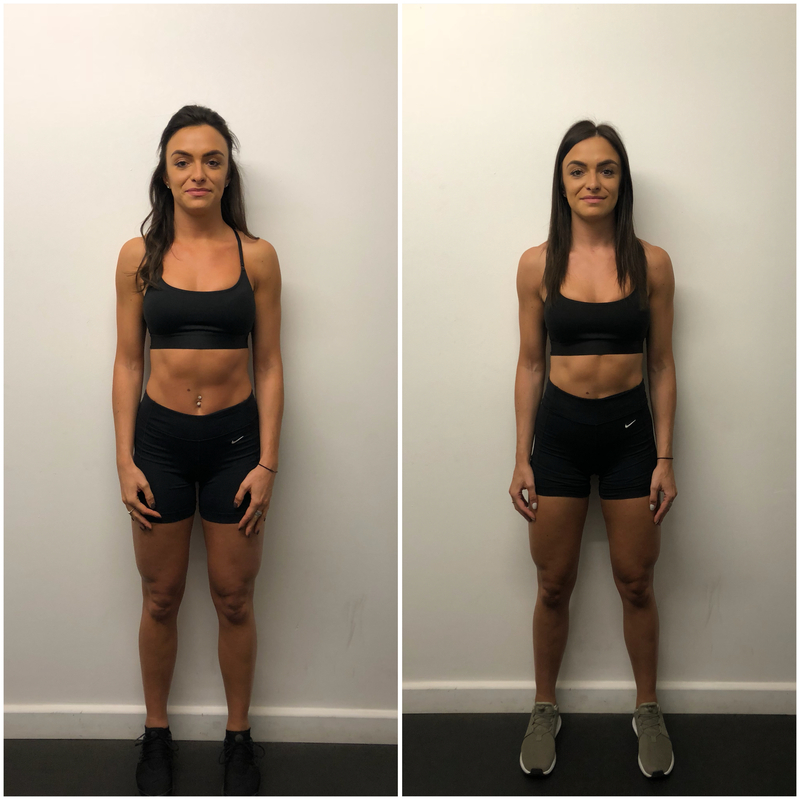 Just by making some simple changes to the foods I was having and when I was having it, stopped my hunger cravings & keeping me fuller for longer, just by making small changes in my form, made me feel it more in the targeted muscle area. Not only in my training, but in my mind. Doing this challenge has helped me to make some decisions and changes in my life that I was choosing to ignore, it’s made me realise my worth and mostly, do what makes you happy! Looking back right to the beginning of this challenge, I can honestly say, I am so proud of myself now, for doing something so challenging, I never thought I would be able to do half of what I’ve done throughout it. I feel stronger mentally, happier within myself, my body feels healthier and stronger. This is has been the challenge I needed and this is the exact overall result I was hoping for. So, thank you Adam, commitment and for believing in me.